Why not save the money for dent repair to buy one bottle of your beloved wine, or enjoy a sunshine travel? One of the most annoying and frustrating things is when you find a dent on your beloved car. Sadly, some drivers will just drive off and never say sorry! Even if the driver leaves contact details, there can be a lot of frustration dealing with body shops and insurers. 1.clean dent surface,If the dent so small and can't see where is it,use a dent board to check where is the dent. Paintless dent remover perfect for door dings and hail damage. Efficient and safe to pop out dents, repair door ding on the metal surface, such as auto, motorcycle, refrigerator, washing machine etc. No damage at the original paint. Dent repair lifter with stainless steel, rubber and durable plastic, they will don't hurt the auto surface, very sturdy and keep a long lifetime. Slide Puller maximum pulling power for the small dents; Back glue sticks and different size puller tabs perfect for the dent remove. PDR dent lifter suitable for any person to deal with any dents. The dent pullers can save labor and easy to lift. 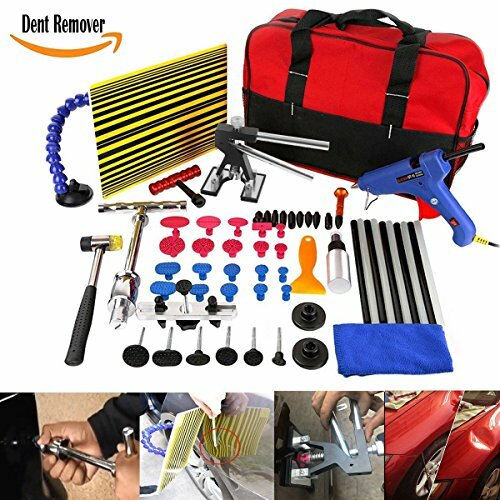 Dent repair kit can save a lot of money for you compared with the auto body shops, our PDR tool kit can help you repair your cars by yourself for many times. If you have any questions about this product by WHDZ, contact us by completing and submitting the form below. If you are looking for a specif part number, please include it with your message.